In the tradition of Buzz Bissinger’s Friday Night Lights, a sensitive and clear-eyed journalist takes us deep inside Oregon’s only all-Hispanic boys’ high school soccer team, a team whose players stand on the cusp of change. For nineteen straight years, the all-Hispanic boys’ soccer team from Oregon’s Woodburn High has made the playoffs. As they prepare to make it twenty, one thing will become clear: Los Perros play the beautiful game with heart, pride, and their lives on the line. Their spirited drive gives a rare sense of hope and unity to a blue-collar farming community that has been transformed by waves of immigrants over recent decades, a town locals call “Little Mexico.” Watched over by a south Texas transplant-a surrogate father to half the squad-this band of brothers must learn to come together on the field and look after each other off it. 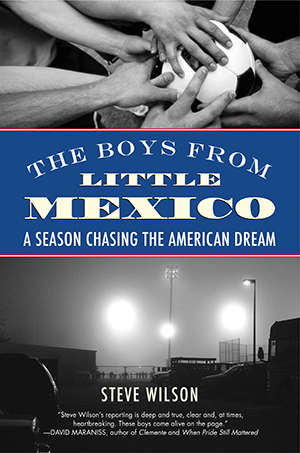 More than just riveting sports writing, The Boys from Little Mexico is about the fight for the future of the next generation-and a hard, true look at boys dismissed as gang-bangers, told to “go home” by lily-white sideline crowds. The wins and losses they notch along the way spin a striking tale about what it takes to capture the American Dream. I carried my one-year-old son, Ben, across the springy running track --one of those made from recycled athletic shoes--heading toward a grass field where about two dozen boys ran back and forth, their attention focused on a black-and-white ball. Coach Mike Flannigan stood watching them, a tall pacing figure, face shaded by a dark baseball cap. He nodded at me as I put Ben down and turned his attention back to the game. The sun, blindingly bright, gleamed off a row of metal bleachers nearby. For the next fifteen minutes, I alternately chased my son and watched the game. Even with my attention distracted, it didn’t take long to notice a wiry midfielder with a pencil-thin mustache who had tremendous ball control. The ball left his foot, bounced around among the other players, and returned, almost as if it were on a string. Like the others that Mike coached, this kid was Hispanic; unlike the others, he played with focus and intensity, his face stern, almost grim. His teammates seemed to be enjoying themselves, but Mustache was locked in a fight. I picked up Ben and walked over to Coach Flannigan as Mustache trapped a pass and dribbled around an opposing player. He was clearly the best player in the group, moving around like a spider, the soccer field his web. Coach Flannigan glanced over. “You’ll have to ask him,” he said. People from Woodburn can be reluctant to discuss their birthplace. With few exceptions, Latinos in Woodburn either were born in Mexico or are Mexican-descended Americans, and for those born in Mexico, legal status can be a touchy subject. Sweat trickled down my forehead, and Ben struggled in my arms as something caught his attention. I put him down. “Have you met Carlos” Coach Flannigan asked. He gestured toward a nearby bench, where a well-built teen sat talking to a girl about his own age. Carlos turned and looked at us. His black hair was combed forward over his forehead and seemed to shimmer with either water or styling product. “How come you’re not playing” I asked. “Injured,” he said, gesturing toward a leg. “Carlos is our keeper,” Coach Flannigan said, his eyes still on the game. “He’s probably the best keeper in the state.” Carlos snorted and turned back to the girl. More sweat trickled down, and I removed my sunglasses to wipe my face. It was ninety-two degrees, the middle of August, and the temperature was forecast to approach one hundred--unusually hot for northern Oregon. The kids on the field were only a skeleton crew of the entire Woodburn High School squad, but here they were, playing an intense pickup game against another partial team at midday on a shadeless field while their coach stood watching, unpaid because it was summer. Ben tottered off toward some football equipment and I followed, thinking, these guys sure take their soccer seriously. I first heard of the Woodburn Bulldogs soccer team when I came across a newspaper article about a game between the Bulldogs and the visiting Lakeridge Pacers, from Lake Oswego, a town twenty miles north of Woodburn. I lost the article after I read it and never tracked it down again, but I recall the story, in a Lake Oswego paper, describing the Pacers traveling to a hostile and foreign land where Spanish was more common than English, and where, the article seemed to suggest, the visiting team was lucky to leave with their cars’ windshields intact. Woodburn, on the other hand, calls itself “The City of Unity” and may be Oregon’s most ethnically diverse community. As of the 2000 census, Woodburn was 51 percent Hispanic, 49 percent Anglo. Even this is somewhat misleading, since about 30 percent of Woodburn’s “Anglo” population belongs to a non-Latino group of immigrants, Russian Old Believers, large, sunburned men with long beards and women with scarf-covered heads, about ten thousand of whom fled religious persecution and ended up around Woodburn in the 1950s and 1960s. The Woodburn Bulldogs and the Lakeridge Pacers don’t play each other often. Because the teams are from different regional leagues, the only times they meet are in pre- and postseason matches. Both schools typically field very good soccer teams; beyond that, there are few resemblances. The two schools represent two completely different Oregons. One could say that they represent two completely different Americas. of Lake Oswego’s. The most notable feature in Woodburn? The Mac- Laren Youth Correctional Facility. The differences extend to the high schools. The students who attend Lakeridge, considered one of the best public high schools in the state, go to college: about 80 percent of Lakeridge grads attend a four-year university and 10 percent attend a community college. Only 5 percent of Lakeridge students are eligible for a free or reduced-price lunch. At Woodburn High, 75 percent of the students are eligible for a free or reduced-price lunch. Not long ago, a lower percentage of Woodburn students graduated high school than Lakeridge sent to universities. It’s so rare that Woodburn’s Hispanic students receive scholarships that the local newspaper writes profiles about the kids who do. With all this in mind, it’s not surprising that people from the two communities don’t mix--usually when they do, it’s because one is mowing the other’s lawn. The one place the two communities come together on equal footing is on the soccer field. Not coincidentally, the two demographic groups represented on that field--uppermiddle- class Anglos and working-class Hispanics--are also the two groups in the United States for whom soccer is a real sport and not a punch line. At the time I first read about Woodburn’s soccer team, I was still a new arrival in Oregon. Woodburn, I knew, had factory outlets--I had seen them from the freeway--but I lumped in Woodburn with dozens of other single-exit suburbs cluttering the hour-long drive between Portland and Salem, the state capital. I didn’t know that at the town’s Greyhound station, one could buy a one-way ticket to the Nayarit city of Tepic, or that downtown Woodburn had the highest concentration of taquerias in the state, or that for girls in Woodburn, turning fifteen was a really big deal. Visiting one weekend, I found that the single exit became a two-lane highway curving into Woodburn, with more traffic than the town deserved. Highway 214 was choked with trucks carrying agricultural supplies to or from the area’s farms and nurseries. A distant line of green hills squatted beyond the town. The residential neighborhoods looked like . . . well, pretty much every other small town in the Northwest: a combination of new and old architecture, lots of trees, pickup trucks, minivans, and a scattering of churches. But, one thing was different. In parks and vacant lots, in front yards and in driveways, I saw boys and men kicking around la pelota--the soccer ball. In Woodburn, on Saturday afternoons, the town’s parks are crowded with Hispanic men’s league games, and the high point of the town’s biggest annual celebration, August’s Fiesta Mexicana, is an intense men’s league tournament. The men I grew up with spent Saturdays playing golf or tennis; in Woodburn, men play ftbol.